Here's the perfect example of how one accessory can instantly transform a home. 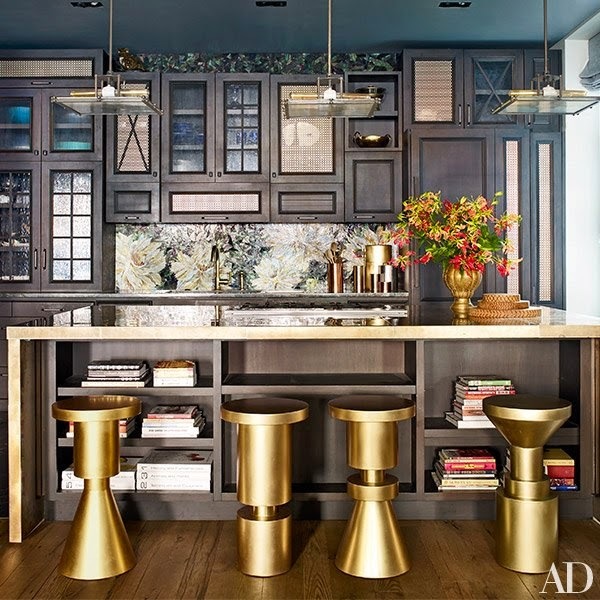 These stools by Anna Karlin from Atelier Courbet made it into the home of John Legend and Chrissy Teigen and they complement the bronze island perfectly. And how fun that the brass stools are based on chess pieces? See more photos of the New York home in the current issue of Architectural Digest. Happy new year! I can't believe it's 2015. The start of the year is the perfect time to create the home you've always wanted. It's not a process that can happen over night. Get started now, pace yourself and really think about what you want your home to look like. Think about how you use each room in your home and the decor you most resonate with. Here are some articles I came across to help spark some ideas on how to transform your home.